Roast chicken: Mark Bittman vs. Julia Child | Recipe Wars! Since I suddenly find myself with all sorts of time on my hands, I’ve decided to get a little creative in the kitchen. Though maybe “gimmicky” is a more accurate adjective than “creative.” To spice up my “New Recipe of the Week” New Year’s Resolution, I’ve decided to compare different recipes for the same thing, a series I’m calling Recipe Wars! Bittman handily wins this round. Though both recipes require you to baste every 8 minutes, Child encourages trussing the chicken, a step Bittman says is helpful but not necessary. While Bittman instructs cooks to flip the chicken from breast side down to breast side up, Child recommends flipping the chicken twice as often: from breast side up to the left side, to the right side, back to the left, then breast-side up again. For a clumsy chicken-turner like me, this is a bit of a pain. What might seem like excessive turning to some cooks (myself included) does result in a nearly perfectly browned–and perfectly evenly browned–bird. I was suspicious about this initially, because the bird is never breast-side down, but Child knows her stuff. The initial advantage went to Child. But Bittman starts roasting the chicken at 500 degrees for 20 minutes (as opposed to Child’s 15 minutes at 425) which results in a browner, crisper skin. However, flipping once, as in the Bittman recipe, does mean that the chicken can end up with a less-browned “stripe” on the sides. (It’s not unlike sun worshippers who lay out in the sun on either their back or front and never end up with a fully even tan because their sides aren’t exposed to direct rays. I grew up in New Jersey, I know this to be true.) To me, the stripe a perfectly acceptable trade-off for the more streamlined recipe. Both chickens come out nice and moist, as long as you use the meat thermometer. 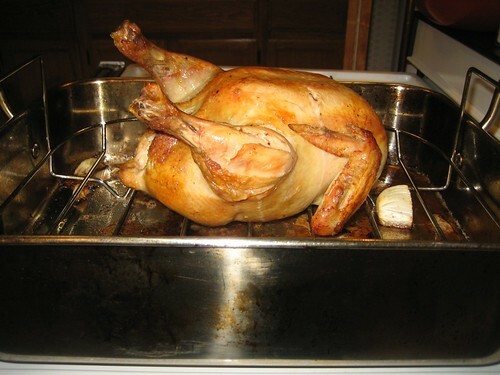 I tend to remove my chickens from the oven at 160-165 (the temperature Bittman recommends). Child says to cook the chicken until the thermometer reads 175-180 degrees, which seems high, but she also offers some additional “indications that the chicken is almost done” for those of us who think roasting a chicken to 175 degrees renders the white meat inedibly dry. Both recipes produce birds with a nicely crispy skin, thanks to frequent bastings with a butter mixture and the initial high-heat roasting. Since Bittman adds herbs to his basting mixture, the skin has a slightly more complex flavor than Child’s, which is flavored with butter, oil, and salt. Child does make the excellent suggestion of adding carrots and onion to the pan to flavor the juices, which adds a subtle flavor but still doesn’t compare to the thyme, rosemary, oregano, or sage in Bittman’s recipe. Bittman, as is his style, seemed to take the best aspects of Child’s recipe (and I’m sure many others) and simplifies it down to the basic steps. His recipe is easier and slightly tastier than Child’s. It remains my go-to roast chicken recipe.